In the same way that “dogs won’t just be for Christmas” this upcoming Winter season, here at DWL we genuinely believe that our selection of high performance aluminium sliding doors aren’t just for the Spring or Summer, instead providing many benefits of value to local homeowners throughout the year. Some of these benefits include wide open views, inherently strong frames, and of course impressive insulation and energy efficiency levels. To guarantee this, you have the choice of three individual sliding door systems to help better suit your specific design choice, budget, and needs. From Smart Visoglide sliding doors that introduce some of the slimmest sightlines possible into the home, to both the ASS50 and ASS70HI systems from Schuco that excel at keeping the home warm, aluminium sliding doors are an investment to be enjoyed throughout the year. Aluminium is undoubtedly a wise choice for anyone who wants to enjoy both open views of their outside as well as lashings of natural light entry in. This is largely because as a material, aluminium is inherently stronger and so can withstand larger panes of glazing, which when combined with either the slim sightlines of our Visoglide sliding doors or minimalist frames of our Schuco variants, a more open-plan living environment is easier to achieve. Both these subtle, simple, yet wildly effective design features help to create the illusion of extra space by giving the impression that your home extends outwards further into the garden. You’ll not only feel much closer to the outside, but enjoy a more welcoming and natural inside space also. Each one of our available aluminium sliding door systems has been specifically designed with protection and security in mind, each featuring burglar resistant multi-point locking for added peace of mind. Additional furniture and hardware options helps to prevent intrusion also, all whilst never impeding on the overall style or user-friendliness. 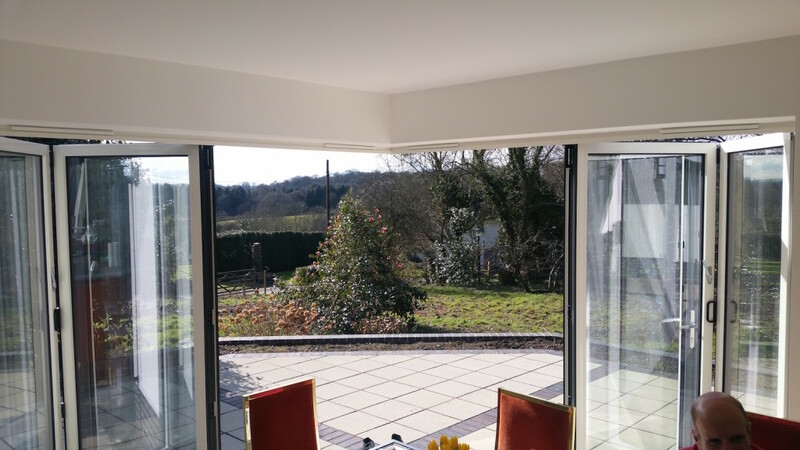 Come rain or shine, your newly installed sliding patio doors will always keep you comfortable, remaining weathertight within multi-chambered aluminium frames that better retains the heat. U-Values as low as 1.3 (Schuco) and 1.8 (Smart) are readily achievable should your property require it, meaning you can spend less money on expensive central heating bills whilst being more environmentally conscious too. Here at DWL, we’re confident that at least one of our high performing aluminium sliding doors can help enhance your home in one way or the other, whether that be stylistically, practically or simply by letting you enjoy wide open views. For more information on the benefits they offer, call our team on 01795 418 538 or send us a message online.